EXUVIANCE products contain the most contemporary1 Alpha Hydroxy Acids (AHAs), Poly Hydroxy Acids (PHAs) and Bionic PHAs which benefit the skin by enhancing and correcting the renewal process, adding firmness, improving texture and tone, refining pore size and moisturising. These acids also help manage oily and acne prone skin and can be used on all skin types including sun damaged skin, very dry skin and sensitive skin. 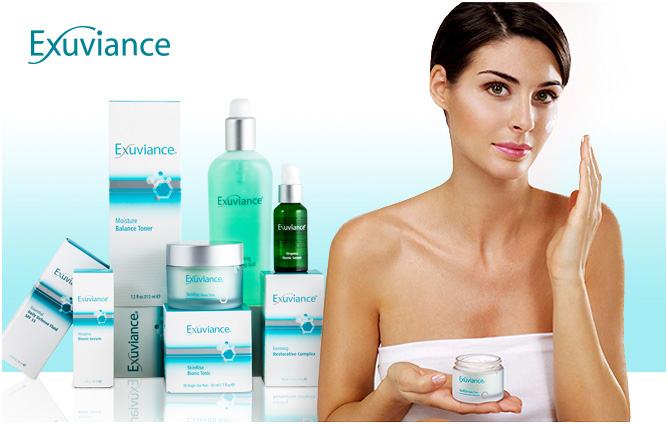 The EXUVIANCE range includes the basic cleansers, toners and moisturisers as well as face and body speciality care and are also available in dramming units for salon use. Age Reverse – BioActiv Wash, Day Repair SPF30, Night Lift, Eye Contour – a comprehensive range addressing all the signs of ageing. This range includes peptides, superfruit potent antioxidants as well as Alpha Hydroxy Acids, Poly hydroxy acids and Bionics.